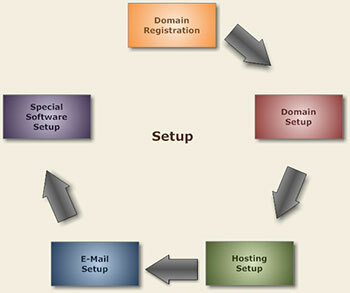 Every website needs a domain name, hosting for the domain name, e-mail accounts and possibly special software installed. Oongawa Design offers these setup services. Domain Registration We can register your website's domain name and maintain its yearly renewal. Domain Setup If you host with Oongawa Design, we will set up the domain on our server for free. Hosting Setup With our hosting plans, we set up your website on our server for free. E-Mail Setup If desired, we can also add e-mail accounts to your website. Special Software Setup We can add additional software to your website, for example, Captchas, shopping carts, slideshows, etc.